Fiber Pole Foot Better Solution to Hollywood Wire Feet | Greater Stability | Made in USA | Midway Displays, Inc. 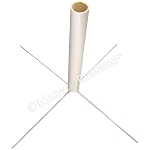 Fiber Pole Foot is a plastic base that replaces Wire Hollywood Feet, My-D Pole Feet is a wire base for fiber pole signs, Bases for Corrugated Signs, Base for POP Marketing Material, fiber tube pole displays, and an inexpensive way to merchandise pole displays. Our FIBER POLE FOOT base is a patented design that is more stable than Hollywood feet, with our Retaining Ring that locks our foot to your pole, creating a mechanical & friction fit. It also has greater stability, no wire residue or leg collapsing.The Fiber Pole Foot is a wireless base that replaces Hollywood Wire Feet. Case studies show our patent design graded higher in stability, aesthetics, and packaging capabilities when compared to Hollywood feet! 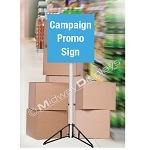 Our MY-D POLE FEET is a metal wire base for signs and displays that use fiber poles, and is our entry level price point to fit those tight budgets. 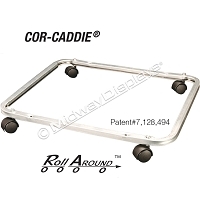 This base is designed to fit between & under open stock cases, with a 24" Tip to Tip Stance, but can be custom sized to fit your needs. Custom sizes are available, but we stock both our standard wire diameter of 1/4”, and our heavy duty wire diameter of 3/16”. It fits pole sizes from 1" OD x 3/4" ID to 2" OD x 1 3/4" ID, and are sold in sets of 2 per set. Samples of our Fiber Pole Foot bases are available for you to compare against Hollywood Feet! Call today 708-563-2323 and speak with one of our friendly sales staff who will be happy to assist you.